Mary Kingsley first sailed to West Africa in 1893 with a bag packed for adventure. Fortunately, it was a waterproof bag. The contents? Quinine to ward off malaria, empty glass vials to fill with Science, and a translation of the phrase “the boat is upset” — which would soon prove itself quite useful. When Kingsley wasn’t poking her umbrella at hippos from a canoe or discovering new species of fish, she was rocking the boat in England as that rarest of creatures — a female explorer. Her first book, Travels in West Africa, immediately became a bestseller. Warm, empathetic and often hilarious, Kingsley’s travel writing belongs on a bookshelf next to any collection of travel essays by Mark Twain, her American contemporary. Kingsley died in Africa of typhoid at the age of 38. To learn more about Mary Kingsley and other 19th-century female explorers, watch the TED-Ed animated video below. Then, scroll down for 4 more TED-Ed Animations to watch during Women’s History Month. TED-Ed Animation: The contributions of female explorers. TED-Ed Animation: The pharaoh that wouldn’t be forgotten. TED-Ed Animation: Equality, sports and Title IX. TED-Ed Animation: The true story of Sacajawea. 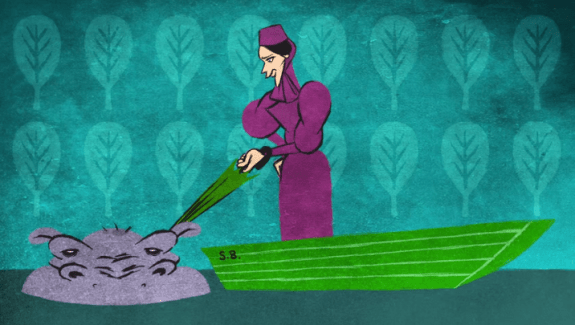 TED-Ed Animation: Where does the word ‘lady’ come from? its very informative work.. learning with fun.